This presentation content is collaboratively developed with Industrial Internet Consortium (IIC) members – GE (WurldTech) and Dell. 1. Security in Action: Sustenance of a smart, connected ecosystem is impossible without built-in security capabilities. Every IOT solution needs to integrate security ground up. IOT architectural security is crucial at the device, infrastructure and server layers. A “security gating algorithm” can be employed to evaluate security readiness at every layer before deployment. I will discuss 2-3 case studies to highlight their security robustness as a success factor. These case studies will be in the areas of IOT infrastructure, Building Automation and ICS/SCADA. 2. Connected Content Platform: The massive leverage inherent in IOT is pervasive. As we transform dark assets to digital for better decision making, its impact spans the globe both socially & economically. The ecosystem involves industrial adopters and stakeholders at every corner on earth. Are we equipped to support the need for the exponential information exchange requirements at this scale? In this section of the presentation, I’ll present the design of a connected content platform that is architected to answer this pressing question. A platform where innovators and solution providers, regardless of their size and location can showcase their products, use-cases and achievements. This platform will emerge as an authority in IOT business communications. Every vendor, user and stakeholder in the IOT ecosystem can utilize this platform as a “GOTO” IOT dashboard. The goal of this project is to streamline information exchange and accelerate meaningful adoption. 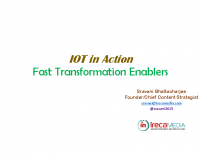 Sravani is a technical architect and the founding principal of IrecaMedia, a business communications firm exclusively focused on IOT and Big Data. Having played multiple award-winning leadership roles in the communications and data networking industry for 20+ years, Sravani is now laser focused to enable hi-tech providers with compelling marketing content and communications. Her rare synergy of hands-on technical expertise and business communication is highly effective to motivate engineering, marketing and buying decision makers to generate the desired business outcome. 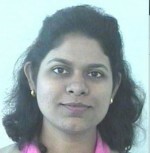 Sravani has a Master’s degree in Electronics Engineering. She received advanced training in direct-response copywriting, specialized in B2B communications. She helps hi-tech businesses excel by communicating their smart innovations through targeted, compelling marketing communications and content. Sravani is closely involved with the new wave of digital transformation and specializes in Internet of Things, Data Analytics, Cloud and Virtualization.